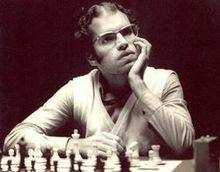 I recently came across a biography of the Brazilian GM Henrique Mecking titled “Latin Chess Genius,” edited and written by Stephen W. Gordon. I particularly liked Gordon’s inscription: “For the girls, the only reason I do anything,” which no doubt refers to his daughters but is also a rather humorous double entendre, since to think of a chess player writing a chess book “for the ladies” is in itself pretty laughable… in any case, the book is wonderful for a few reasons. First of all, it contains a wealth of biographical insight condensed into only 20 or so pages, providing the reader with details about Mecking’s illness and its effects on his career, as well as filling in a few gaps with anecdotes from his showdowns with the worlds greatest. In the 1960’s and 70’s, Mecking was a breakout chess player who scored well against the top players of the day, reaching a candidates match with Kortchnoi which he lost by 2 points, tragically weakened by illness. The game below is one which he played against fischer, winning Fischer’s queen in the early middle game. It’s a masterpiece as far as I’m concerned, and demonstrates the value of piece activity above all else. Mecking’s style was wild, active, and attacking, not unlike Fischer’s, and the two played many of the same openings. To watch them do battle is to observe two of the brightest chess minds of the 20th century swashbuckling for piece activity: Enjoy. Here is another notable game of Mecking’s, from his first interzonal appearance.